OAKLAND, Calif. -- Oakland's mayor and some business owners called for tougher action Saturday after what police said was some of the heaviest damage yet in peaceful public marches in the San Francisco Bay city that have turned violent. 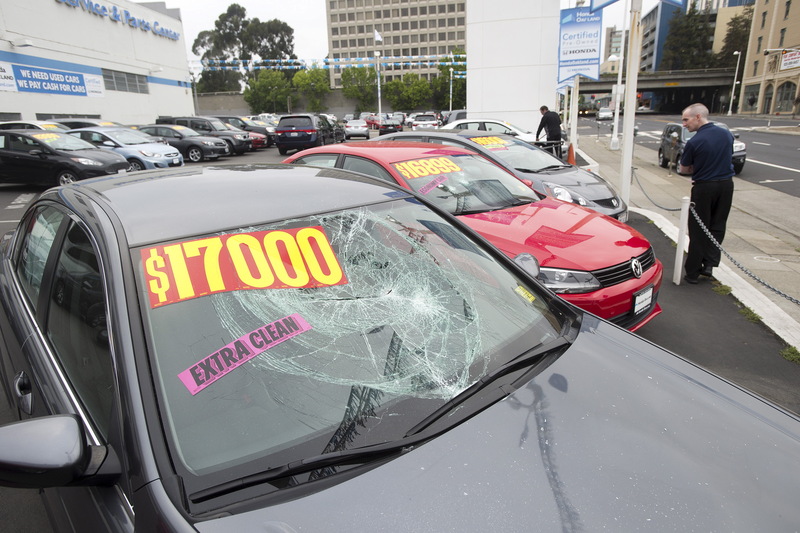 At a downtown Oakland car lot, security-company owner Steve Tittle walked Saturday through what had been a plate-glass door of a business storing new Hyundais and Hondas for car dealers. "Step into my office," Tittle joked, while avoiding the broken window glass that now surrounded the smashed and empty door frame. Vandals overnight Friday and Saturday shattered the windows at the car lot's offices, smashed the windshields of dozens of new autos lined up outside, and set afire one Hyundai Elantra. "This is not civil disobedience," Tittle said, of the 300 to 400 attackers who Oakland police said had broken away from what had been a day of peaceful May Day marches Friday by both supporters of labor unions and protesters against police violence nationally. "This is an anarchy, chance-to-destroy mob, nothing else." Asked what he thought would stop the vandalism to businesses, Tittle said, "Punishment." The destruction at the auto lot marked the heaviest damage in scattered attacks by protesters overnight Saturday that shattered the windows of banks and other businesses over more than a dozen blocks of downtown Oakland, a center of political activism in the Bay Area as well as home to some of its poorest neighborhoods. Police Chief Sean Vincent, speaking Saturday to reporters at City Hall, said the overnight damage "was amongst the worst we had seen" in more than 1½ years of sometimes-violent protests here over instances of police killings of African-American men around the country. Police said they arrested a dozen people on charges that included burglary, failing to disperse and vandalism. The only injury reported was a cut leg suffered by one officer. Police used force only twice - once when officers fired a tear-gas canister, and once when an officer tackled a violent protester, Vincent said. Police had difficulty controlling a nighttime crowd that turned "larger than we expected and angrier than we expected," he said. Mayor Libby Schaaf, who stayed on the streets overnight monitoring the crowds and talking to owners of damaged businesses, said city officials "did not do as good a job as we should have protecting property." Not every Oakland resident wanted to see a crackdown, however. Community organizer Ruby Reid, who lives within earshot of the sound of breaking windows and police loudspeakers overnight, said the violence of the protests was overstated and the messages against heavy-handed policing important. "Actual violence is being getting hurt, people getting shot" in police custody, she said.